Centurion Nominees must have been registered in the BSA, the local council and the Order of the Arrow lodge during their recognized “service period.” A nominee need not have remained registered in the BSA, local council or Order of the Arrow lodge past the service period, nor at the time of nomination. Therefore, nominees may be living or deceased and should have provided significant contribution(s) to the lodge’s legacy. Evidence of a historical member of the lodge may, but need not be, sourced from information within the lodge’s centennial history book. Each nominee must be designated as either a youth or adult contributor. A youth contributor denotes that the nominee’s service period occurred while he was under 21 years of age. An adult contributor denotes that the nominee’s service period occurred while he or she was over 21 years of age. An adult contributor can be recognized for his or her service as a professional or volunteer. The minimum service period is 3 years for a youth contributor and 6 years for an adult contributor. Time as a youth contributor may not be applied to the minimum time for an adult contributor (i.e., there can be no adult contributors under 27 years of age). 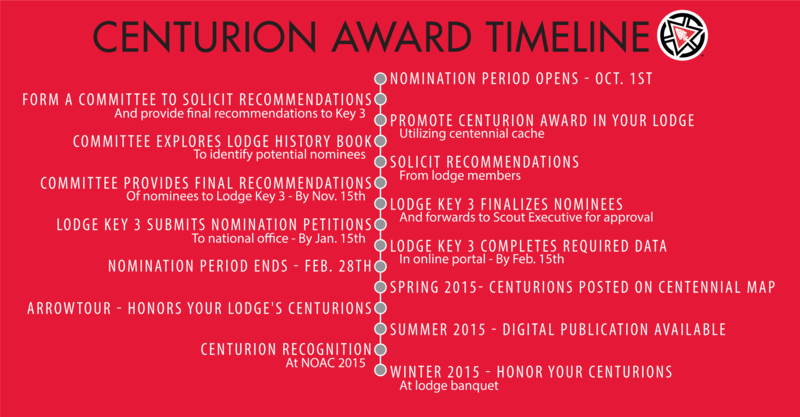 From October 1st, 2014 to February 28th, 2015, Lodge Key 3s can submit their respective lodge’s Centurion nominations to the national office. A recommended timeline that is available on the national OA website has been provided to assist lodges through the selection and submission process. Lodges may nominate a number based on a ratio of 1 per 100 chartered members or fraction thereof, according to 2013 membership data (i.e., data provided for rechartering in or around December 2013). Lodges with fewer 800 chartered members will use the same ratio but may petition the national OA committee for such additional nomination slots to increase their total to 8. Awarding those additional nominees with the Centurion Award will be entirely at the discretion of the national committee. Lodges must specify which nominees are part of the petition for additional nomination slots (versus those in the core allotment). To commence the selection process, the Lodge Key 3 will solicit recommendations for potential nominations of these “Hometown Heroes” from lodge members through the Centurion Award Petition. The answers provided in support of the Arrowman should not be a list of awards received by a potential nominee, rather an insightful anecdote (in the form of a testimonial) on this Arrowman’s unique and exemplary service to the lodge. After careful review of the received recommendations, the Lodge Key 3 will determine their lodge’s list of Centurion nominations prior to the established national deadline. Following signed approval from the Scout Executive, the Lodge Key 3 will submit their respective lodge’s petitions and the Centurion Lodge Verification Form to the national office for approval. Once the national office confirms receipt and acceptance of the nomination, Key 3’s will be directed to upload each Centurion’s name, hometown, lodge, council, dates of service, testimonial and picture electronically through an online portal. The data gained through the online portal will feed directly into a digital publication chronicling the stories of each of these Arrowmen. Nominees selected by the national Order of the Arrow committee will be provided with a certificate and recognition ribbon consisting of a red and white ribbon and a metallic totem symbolizing the centennial anniversary of the Order of the Arrow. Details on the ordering of these recognition items will be announced at a later date. There are a variety of opportunities for Centurions to be recognized, at the local, regional and national levels. First, several opportunities will occur during the 2015 National Order of the Arrow Conference in August. All attending Centurions will be encouraged to wear their commemorative medallion when in Class A uniform. Additionally, the NOAC Centennial Celebrations Committee plans to honor the deeds of Centurions at key conference events. For example, Centurions will be highlighted during the Centennial Show and invited to a special reception at the Centennial Festival. The Centennial Gala will also acknowledge the contributions of Centurions over the course of the banquet program. Second, a digital publication on the national OA website chronicling the stories of each of these Arrowmen will be published. Each entry will include a photo of the Centurion in service, a listing of the lodge, council and hometown, as well as an anecdote provided from the nomination on this Centurion’s unique exemplary service to the lodge. This publication will be made available after all nominations have been submitted, but before the 2015 National Order of the Arrow Conference. Third, during ArrowTour, part of each region’s static display will be reserved in order to recognize local Centurions from that particular geographic area. Finally, lodges are encouraged to recognize their Centurions at appropriate lodge or council functions. Such examples include the lodge’s annual holiday banquet. To successfully support our local council’s lodge in recognizing its “Hometown Heroes,” carefully consider nominating Arrowmen who have selflessly exemplified the ideals of brotherhood, cheerfulness and service and passionately devoted themselves “to help other people at all times” and meet the needs of others. Upon entry into the OA’s next century of service, these Centurions will serve as a hallmark and ardent reminder of our Order’s commitment to cheerful service. All Arrowmen are encouraged to recommend potential nominations to their Lodge Key 3s beginning today. Please see the Centurion Award FAQ page for a listing of common inquiries. 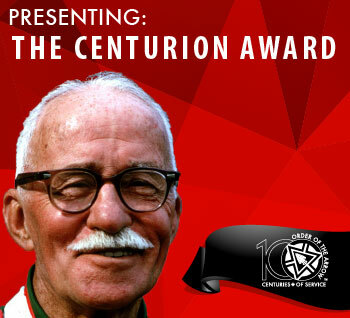 Any other questions on the Centurion Award can be directed to @email. A recommended timeline has been provided to assist lodges through the selection and submission process. Use the Centurion Award Petition to commence the selection process. This petition must be submitted to the Lodge Key 3 for consideration. After careful review of the received recommendations, the Lodge Key 3 will determine their lodge’s list of Centurion nominations prior to the established national deadline. The Lodge Key 3 will submit the Centurion Lodge Verification Form to the national office for approval.